The following guide describes the neccessary steps to install and configure a pair of cisco nexus 1000v switches to be used in a vSphere cluster. These will connect to Cisco Nexus 5020 Upstream Switches. 3x HPProliant DL380 G6 with 2 4-port NICs. I am assuming you have already installed and configured vCenter and the ESX cluster. // These commands give a description to the port and allow trunking of VLANs. 3) Service Console VLAN !!! When I installed the ESX server, I used the native VLAN, but after you change the switch port from switchport mode access to switchport mode trunk, the ESX server needs to be configured to send specific VLAN traffic to the Service Console. 4) Add Port Groups for the Control,Packet and Management VLANs. 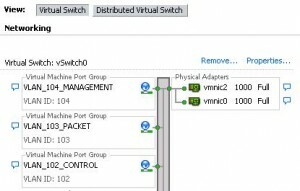 I add these Port Groups to VMware Network Virtual Switch vSwitch0 on all the ESX hosts. Make sure to select the right VLANs for your environment. 5) Now that you have configured the Control,Packet and Management Port Groups with their respective VLANs, you can install the Cisco Nexus 1000v. I chose to install the Virtual Appliace (OVA) file downloaded from Cisco. The installation is very simple, make sure to select to Manually Configure Nexus 1000v and to Map the VLANs to Control, Packet and Management. The rest is just like installing a regular virtual appliance. 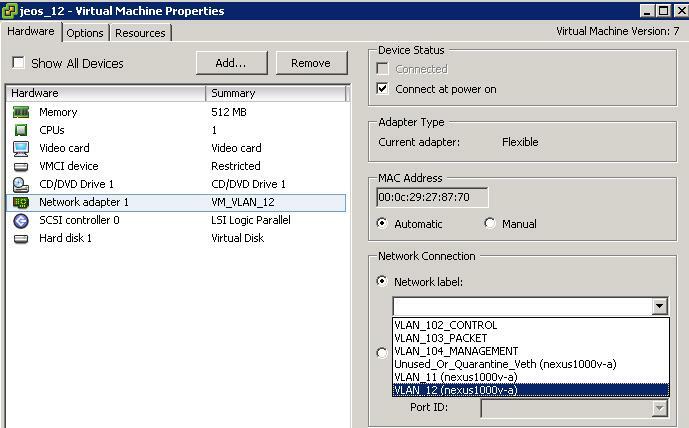 6) Power on and open a console window to the Nexus1000v VM(appliance) you just installed. A setup script will start running and will ask you a few questions. Network Information // Things like IP, netmask, gateway Disable Telnet! Enable SSH! Once you have the Nexus 1000v basics configured, you should be able to access it. Try to SSH to it (Hopefully you enabled SSH). 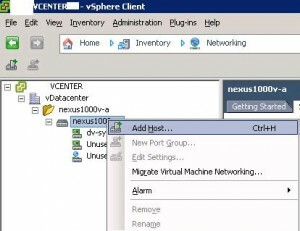 Open vSphere client and connect to the vCenter. You do NOT need to Download and Install the Plug-in, just Register it. In this step we are defining the SVS connection which is the link between the VSM and vCenter. The Cisco Nexus 1000v acts like the VMware DVS. 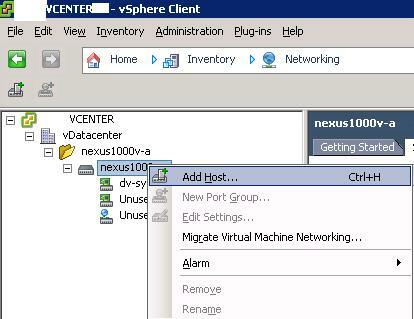 Before you can add hosts to the Nexus1000v you will need to create uplink port-profiles; which will allow VEMs to connect with the VSM. 14) It is now time to install the VEM on the ESX hosts. The preferred way to do this is using VUM(VMware Update Manager). If you have VUM in the system the installation will be very simple. Port-Profile configure interfaces on the VEM. From the VMware point of view a port-profile is represented as a port-group. At this point you are ready to use the Cisco 1000v, but if you plan to run this in a production environment, it is strongly recommended you run the VSM in High Availability mode. Written by Cisco Nexus 1000v VSM High Availability | Technologist about 8 years ago. Written by VIJAY SHEKHAR about 8 years ago. HI John, this is a very good writeup. I was wondering, in STep -10 you creeated SVS connection to vCentre. is this over Management VLAN? IN Step 12 you created those VLANS on VEM, I am wondering how the connection between VSM & VCentre coming up without those VLANS in place at the first place. 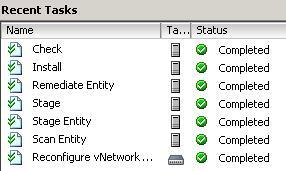 In Step 10, I am creating the SVS, which is a communication link between the nexus and vCenter. The nexus switch will communicate to the vCenter using the following protocol(VMware VIM over HTTPS), you need to make sure that packets route between the nexus (192.168.101.10) and vCenter (192.168.10.10). The other 2 VLANs are for PortGroup VM data traffic. So is your 192.168.101.10 interface not part of VLAN 101? 192.168.101.10 interface is the VSM Mgmt IP right? and we can Telnet/SSH to VSM via that IP. I am assuming they both are same. Please clarify how they are different and why there is a need of 2 mgmt Interfaces? In my case, 192.168.101.10 is the Management IP of my Cisco 1000v VSM. This management interface and IP sits on VLAN 101. This management IP is what I use to SSH/telnet to the Cisco Nexus 1000v VSM, it also is how the Cisco Nexus 1000v communicates with vCenter. VLAN 101 has a network route to the VLAN 10, where the vCenter is located. There needs to be a route so they can communicate (The Cisco Nexus 1000v VSM and vCenter). There also needs to be a network route from your workstation VLAN to VLAN 101 so you can SSH/telnet from your workstation to the Cisco Nexus 1000v VSM. So my initial understanding of this by reading the article was correct. Now let me reword my original Q. In STEP-10 SVC config is done and verified, that means the connection between VSM and vCentre comes up BEFORE Creating the management VLAN 101 which was done in STEP-12. How does this happen? Is it because VSM has a Dedicated physical Mgmt NIC? In Step 4 you created portGroups on the regular switches with access to the control,packet and management VLANs. When you install the Cisco Nexus 1000v you select the management interface to go into the management portGroup, which is on the management VLAN. At that point the management interface of the Cisco nexus 1000v is on the management VLAN and can reach vCenter as you can see in step 10. In step 12, I am creating all the VLANs on the nexus1000v, including the VLANs that will represent portGroups on vCenter. Written by Kevin D’souza about 6 years ago. This is a amazing article, makes everything so clear. Written by dave about 6 years ago. Written by find best insurance about 6 years ago. topic of my presentation subject matter, which i am going to present in academy.